This famous saying is by Jonas Salk who is among the most respected medical scientists of the century. He developed the first safe and effective vaccine for polio. Jonas Salk was born in New York City on October 28, 1914, the eldest child to parents Daniel Salk and Dora Press. His family was not wealthy but emphasized the importance of education to their three sons. Jonas attended a high school for gifted children in New York City and then enrolled at City College of New York where he received a degree in chemistry in 1934. Salk then was accepted to New York University to study medicine. His intention was always to become a medical researcher rather than a medical practitioner and he graduated with his doctorate in 1939. After working as an intern at Mount Sinai Hospital for two years, Salk moved to University of Michigan, where he studied flu viruses with Dr. Thomas Francis Jr. In 1947 Salk accepted an appointment to the University of Pittsburgh Medical School and he began research on polio. The following year he was funded to ascertain the number of types of polio virus. Polio (or infantile paralysis) is an infectious disease caused by the poliovirus which results in muscle weakness, especially in the legs. Over the next seven years, Salk discovered that there were three types of polis virus and extended his research to developing a vaccine. Summertime in America in the 1940’s and 50’s was a time of concern and worry for many parents as this was the season when children by the thousands became infected with the crippling disease, from which not everyone recovered. The 1952 American epidemic was the worst outbreak in the nation’s history. Of nearly 58,000 cases reported that year, over 3,000 people died and over 20,000 were left with mild to disabling paralysis. 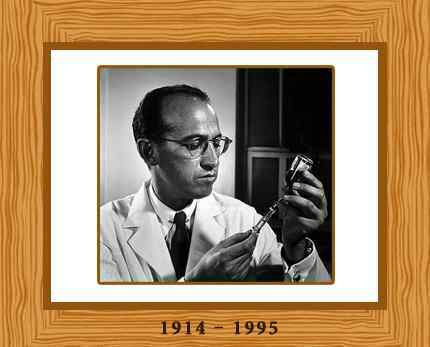 Salk developed a “killed-virus” vaccine and he first testing of his polio vaccine began in 1952. By the end of testing approximately 1.8 million children had been vaccinated. The vaccine was approved for widespread use in 1955 and Salk became world-famous overnight. In the following years the incidence of polio in America fell from 18 cases per 100,000 people to less than 2 per 100,000. In the years after his discovery, many supporters, in particular the National Foundation “helped him build his dream” of a research complex for the investigation of biological phenomena. The Salk Institute for Biological Studies opened in 1963 in California carrying out research on diseases such as multiple sclerosis and cancer. Salk remained director until 1975 and he then became its founding director. He continued working on research in the 1980’s, studying AIDS and working on a vaccine against HIV. In 1939, Salk married Donna Lindsay and together they had three children. The couple divorced in 1968 and Salk married French painter Françoise Gilot in 1970.